For a long time, the light in Jane Namusisi’s home meant constant worrying. Jane is like millions of women and men in Uganda who live without electricity and rely on the dangerous and toxic flames of kerosene lamps to cook, read, or see each other when the sun settles down for the night. For these millions of mothers, fathers, grandparents and children, there is a constant fear that the kerosene lamps will knock over and burn the house. There is also a fear that the dark, thick smoke from the lamps would cause serious health problems for the family. Jane had these fears. For years, her daughter, three grandchildren and herself shared a tiny, two-room house with kerosene lamps spread about the cramped quarters. The children and adults shared two single beds in one room while their small kitchen was directly outside the main door. With kerosene lamps, I worried that the children would get burned in the house or there would be damage to my property. I would worry about getting sick because when I touched my nose after handling the lamp, I would get black soot in my nose and some coughing. Thankfully, nothing and no one in the house ever got burnt. However, she longed to find a safer alternative but her community wasn’t connected to the grid. Also, she couldn’t afford safe, solar lamps. In 2016, however, Jane stopped worrying. A neighbor introduced her to FINCA’s group loans. The 54-year-old spends her days with her small-scale quarrying business, chipping rocks for gravel. Around the same time, Jane learned about BrightLife’s solar lamps from an agent and used her profits to purchase a small solar lamp for the family’s main room. 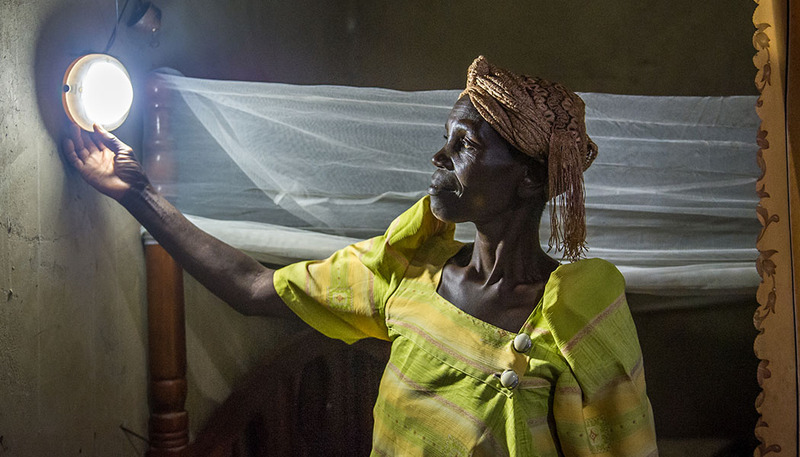 The BrightLife solar lamp can last up to 45 hours and just requires a small solar panel to keep Jane’s home bright. She also uses it to charge her phone with a convenient USB port found on the back of the lantern. She lets her neighbors charge their phones as well, saving them time and money from having to go to the nearby store for phone charging. She is also saving money from kerosene purchases which she would have bought weekly at a store that is a ten-minute walk away. With all these benefits, Jane is happy. She and her family are finally living worry-free, thanks to a little but powerful lamp in her home that has brightened their lives.